A blast of color with the sheer indulgence of Cocoa Butter. Elle 18 Lipstick is one of the most budget friendly lipsticks available in India. I have tried so many lipsticks both Indian & International brands be it Palladio herbal lipstick, Oriflame power shine or Nyx round lipstick, none of these being so cheap.These Elle18 lipsticks are available in lot many shades to choose from it huge shade list. I remember I had a tough time choosing the shades since the shades are so many and many shades are very similar to other and tend to look alike with just slight difference. I can truly say the company has taken care of including the lightest to darkest shades of red, pink, pretty peach and several other colors covering the entire glimpse of shade in between, at least tried to cover if not completely did. They have a huge shade list to choose from, which can be slightly confusing like it was for me.Finally after few swatches I picked up 3 shades Coral Romance, Pink Pout and Cinnamon Bun. I haven't tried the Pink Pout & Cinnamon Bun yet but wearing Coral Romance all these days and here is the detailed review on it. What Elle 18 Lipstick Claims? Frosted Cherry to Iced Chocolate, from Spice Ginger to Grape Rain. PRICE - Rs 100/- for 4.3 ml. Also Available : JUICY LIP BALM, COLOR BOOST LIPSTICKS. The packaging of these Elle 18 Lipsticks is quite simple yet cute because of the colorful pink animated pout on the black. The packaging truly gives the feel of a product meant to in a teenager college going girls bag. I don't know if you could make out what I mean by this, but that's how I felt at first look. The lipstick seems to have a very pretty shade on first look. 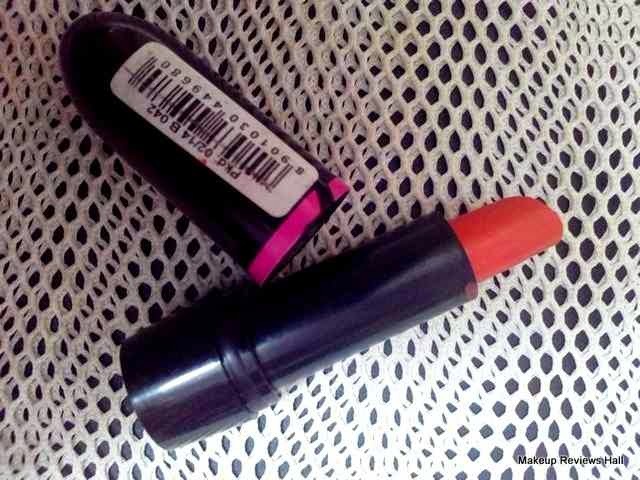 It's a bright coral shade that any girl would love to try as soon as she sees it. I was actually in search of such a shade which is somewhat peach with a slight orange touch and I think I could not find a shade better than this Coral Romance. At least in the lipstick it appeared so, and I had to give this a try. As soon as I swatched the lippie on my hand, it was so pigmented. 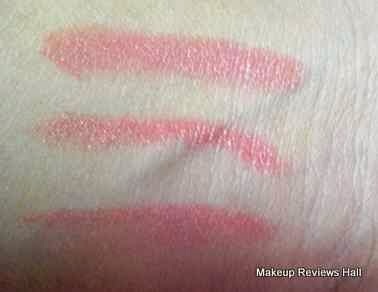 I had no clue that such a low budget lipstick would be so pigmented in a single swatch. Take a look below at the swatches below just with a single effortless swipe. On application on lips, it glides smoothly without any tugging but the pigmentation is not that strong as it looks on hand. The reason being hands are far more lighter in shade that lips and makes the color look more prominent & radiant. I had to swatch it almost twice fully and a bit more here and there for the desired look. 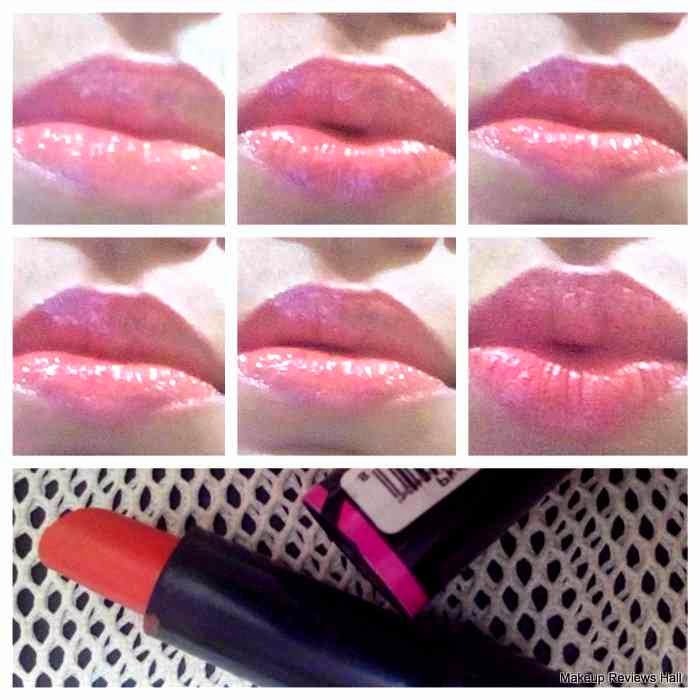 Although I found to be little gaudy after 3 swatches so I followed it with a transparent lip gloss which ultimately gave me perfect beautiful bright yet not gaudy beautiful coral shade. Take a look below. I was super happy with the entire look of this. 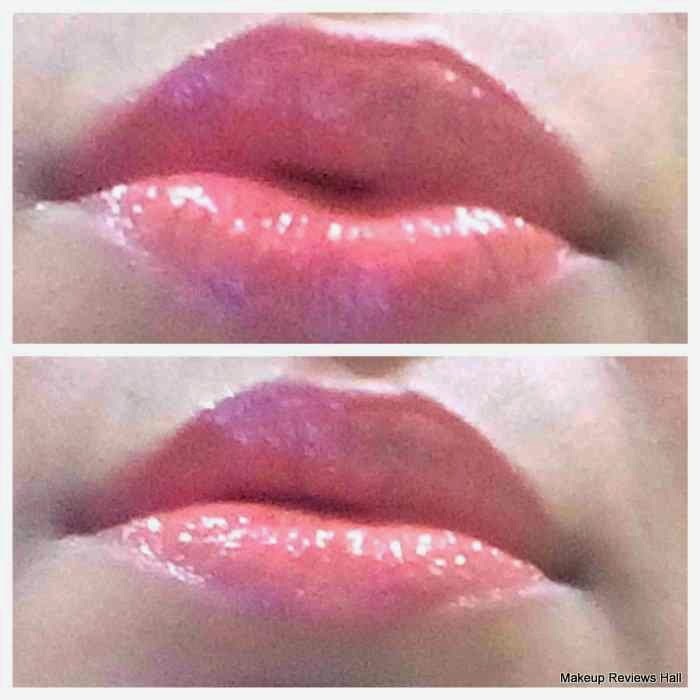 The good thing was inspite of a bright pigmented look, it did not dry out my lips at all, rather I felt it to be slight moisturizing because of the creamy soft look. 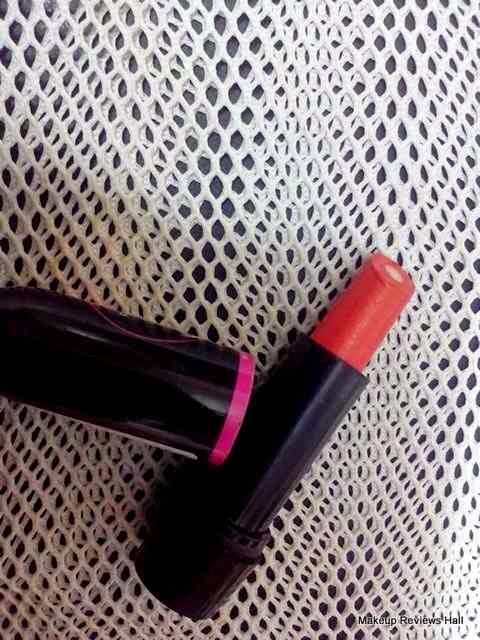 The bad part being that this Elle 18 Lipstick gets easily wiped off if you eat or drink something. I know that's something very normal specially with a lipstick at such an affordable price. If you do not eat or drink anything, this remains on your lips for about 2-3 hours easily. Also Read : Maybelline Moisture Extreme Lipstick. After all this best, let me come to the worst part of this lipstick. This lip shade would not look good on pigmented lips. If you have a mix of light dark pigmented lips than you should stay away from this since this a light shade and not capable of covering pigmented lips to give an even finish. However if one has normal shade lips with no pigmentation, this is going to be the best colored girlish lipstick for a light gentle daily use. 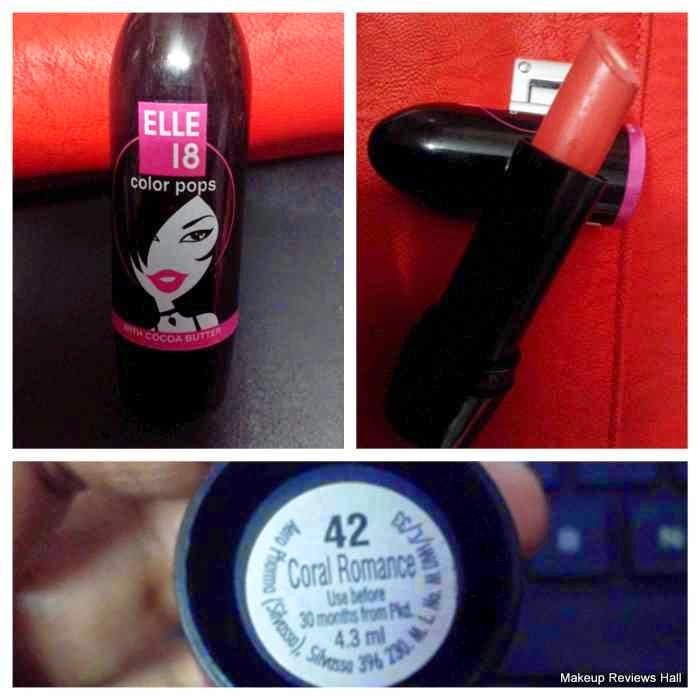 I have listed almost everything about this Elle 18 Color Pops Lipstick Coral Romance. It's one of the best budget friendly lipstick available in India in huge variants. One should definitely try this shade if you have even lips and fair skin tone. You would simply love it but girls with dusky tone or uneven lips can simply skip it or try using it with lip liners to simply mix and match colors to get the desired shade or can all together buy any other variant from whole lot of shades and variants available. Coral Romance a beautiful girly shade. A perfect coral shade for everyday daily wear. No tugging or drying of lips. Shade can be taken as a dupe of shade of other big brands. Elle 18 brand, very popular in India. One of the budget friendly brands in India. Available in lot of shades to choose. Easily available online offline even at small corner shops. Easily gets off if you drink it eat something. Stays on for only 2-3 hours. Cannot cover pigmented looks to give finish finish. Pure bubble gum fragrance which might be irritating for beauties with sensitive nose. Elle 18 lippies are very cute! I have a few of them.. <3 lovely review dear.